This year, in the true spirit of Christmas, we’re doing the Miniclick Photobook Advent Calendar where we’ll look at a different photobook, newspaper, magazine or ‘zine we like by someone we’ve worked with in the last 12 months, right up until Christmas Day. To view the Advent Calendar picks so far, click here. “The Landscape of Murder documents all the sites where murders occurred in London between January 1st, 2011 and December 31st, 2012. In total 210 murders were committed over this two year period.Most murders make the news for only a fleeting moment and the landscape in which they occur reverts back to normality very quickly after the forensic teams leave. Yet the scars remain, sometimes subtle, sometimes very open, whether a single solitary flower or the gathering of grieving family and friends. Sometimes nothing remains to show that a life has ended violently in a particular location. 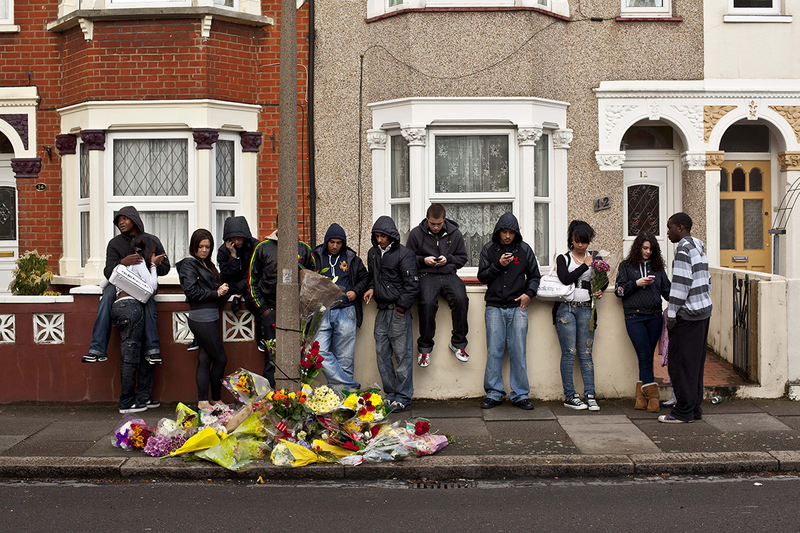 Over the course of 2 years, Antonio travelled around London (using the M25 as his boundary), visiting and photographing the 210 murder sites that occurred in that time frame. It all started when he heard of a woman who had been killed in his neighbourhood and walked passed the scene (her house) a couple of days later. He was surprised by the normality of the scene that he found, and even that neighbours didn’t seem to know it’d happened. This is a theme that’s repeated throughout the book – we know something terrible has happened here, but life is moving on. Small marks on the landscape that appear to be temporary – a hand written note or a bunch of flowers. On the rare occasions where mourners appear in the photos, it brings home the significance of what happened, acts as a reminder to the reader and imbues a great deal of power into his images. The edit of the book dictates this perfectly. There’s nothing forensic about Antonio’s images here, they are warm images and this encourages us to study them further and further, noticing more and more details, perhaps trying to see beyond the banality of the scene for something that quantifies what happened. We see the odd policeman or forensic scientist, police tape, flowers and in one particularly powerful image, blood stains on the pavement. Another image shows a busy road crossing, with one stationary character that has stopped to read the card on the flowers pinned to some railings. This is a project that really stays with you, and that’s where Antonio’s skill lies. Each image is accompanied by a short paragraph on who died and what happened, which further increases the impact. I mentioned already how good the edit of the book is and the thought and grace applied to that and it’s design matches he images perfectly. The hardback book is published by Dewi Lewis (160 pages with 210 colour photos), and costs £30 from here over here.